Nila Belfiore-Dulay and her husband, Henryk, took seven days to drive cross-country to their new life in Charleston, South Carolina, last week, because they didn't want to risk flying their dogs, Josie and Annie. Soon after they arrived, they were told to turn back. Charleston, in the line of Hurricane Florence, was in a mandatory evacuation zone. "We were there about five days before they told us we would have to evacuate," Belfiore-Dulay said, sounding politely upbeat but a bit uncertain from a La Quinta motel in Jacksonville, Florida. Who goes to Florida to escape a hurricane? (Florida is the most "hurricane-prone" state in the U.S., according to several weather-forecasting sites and the U.S. government.) Some pet owners from South Carolina and Georgia wound up there because they couldn't find rooms any closer as they evacuated the area Hurricane Florence was expected to pummel. "The hotel is packed with dog owners. The dogs are having a blast," Belfiore-Dulay said. "They were unsettled at the beginning. But now that they are settled, they are having a blast." While rumors have been spread on the internet that hotels and motels have to accept guests with pets during emergencies, it is up to the proprietor to accept or deny animal guests unless they are certified service animals, like dogs that assist the blind. 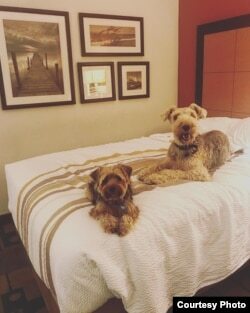 Belfiore-Dulay said that after a number of frustrating tries for a room in Georgia, she turned to www.bringfido.com to find a place that would accept humans, plus Josie, her Airedale terrier, and Annie, her Yorkshire terrier. That's where she found the welcoming La Quinta and other storm evacuees. Of the estimated 90 million pet dogs in the U.S., 50 of them had found refuge at the motel. Not all people are able or willing to leave their homes and pets in a catastrophe. After Hurricane Katrina devastated New Orleans and the U.S. Gulf Coast in August 2005, one-third of those polled in a survey chose to stay behind. The main reasons for staying? Eighty-two percent said they did not want to abandon their homes. Forty-four percent said they did not want to leave their pets. Only 18 percent said they did not want to leave family. The data came from a poll conducted by the Fritz Institute, a nonprofit organization working "to innovate solutions … for rapid and effective disaster response and recovery." Those who cannot flee with their pets often turn to animal shelters to take the pets until the owners can return. Some shelters are so overwhelmed that they close their doors when filled to capacity or are fleeing the storm themselves. Among those animals that survive a catastrophe after being abandoned, many have no identification collars or tags. Even if rescued, they may never be reunited with their humans. Overwhelmed shelters, as reported by The Washington Post, may eventually euthanize animals. "Last year alone, the ASPCA responded to six disasters including hurricanes Harvey, Irma and Maria, and the wildfires in California, assisting more than 37,000 animals through pre-evacuation, field rescue and post-disaster relief efforts," the American Society for the Prevention of Cruelty to Animals reported on its website. Belfiore-Dulay said the motel managers have been understanding of pet owners who couldn't or wouldn't leave animals behind. "It's a little bit noisier because of the dogs," Belfiore-Dulay said. "As you walk down the hallway, you hear their noses sniffing at the door. Then they bark, then you hear their owners telling them to calm down." Residents fled from North Carolina, South Carolina and Georgia in a storm described by meteorologists as having an intensity never seen before. The refugees in Jacksonville are bonding over doggy play dates and shared concerns about what is happening back home. "We've met people who were in the same boat, and had to leave. … We understand one another," Belfiore-Dulay said. When not playing with their dogs on the grassy property or its pond — "There are cranes and ducks to torment. ... 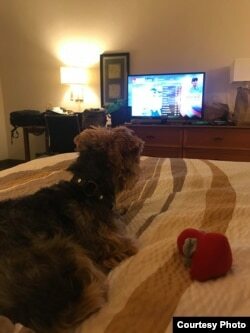 They are terriers, of course," Belfiore-Dulay said — most people dine out and then return to the motel to gather around the televisions in their rooms. "We watch a lot of the Weather Channel," Belfiore-Dulay said. The dogs seem to, as well. The couple hope to finally take possession of their new home next week. Meanwhile, their worldly possessions remain in a storage container near the North Carolina-South Carolina border in the path of Hurricane Florence. "It's near where they are saying the surges are higher, and that's unsettling," Belfiore-Dulay said. News photos of drenched people being rescued from flooded areas show some with pets in tow or tucked under their arms. CNN interviewed a woman who had neither the resources nor ability to flee the storm with her seven dogs. Strangers crowdfunded enough money to rent her a van in which she fled to Tennessee. These evacuees are not alone. Of the more than 66 million households that have pets in the U.S., 66.3 percent say they consider their pets to be family members, according to the Humane Society of the United States. 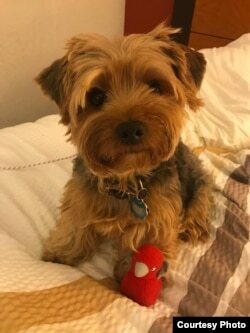 "Additional study and planning should be considered concerning the care and treatment of family pets and animals in the aftermath of natural disasters," advised Fritz in its report. "Animal assistance agencies should be taken into account in the preparedness planning for major disasters in the United States."